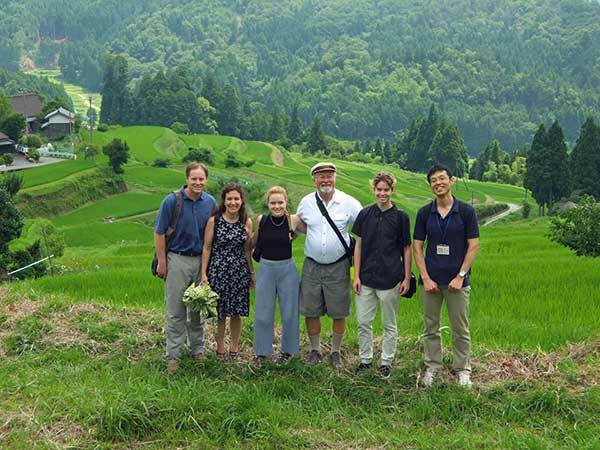 Tour guide Seita Mori (right) amid terraced rice paddies in Hata, Takashima. It’s about time I introduce YUtour (悠ツアー), a licensed tour guide service for foreign tourists in Shiga Prefecture run by my friend MORI Seita (森 聖太) in Otsu. YUtour is a one-man operation with Seita-san as YUtour’s one and only English-speaking guide. All indicators (such as TripAdvisor comments) show that he is doing an outstanding job. And after having a long lunch with him the other day in Otsu, I believe it. 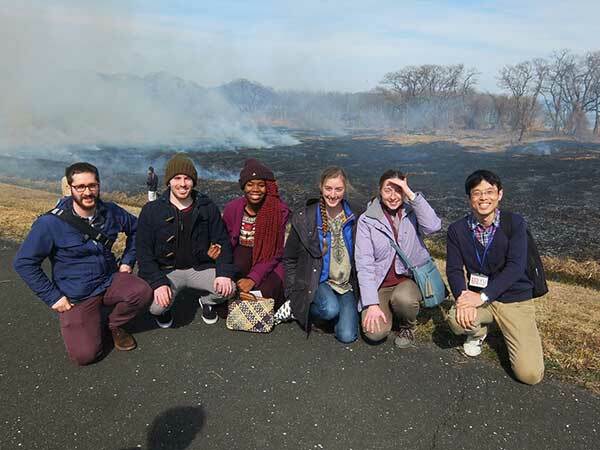 YUtour’s guided tours in English focus on the rural areas, ecotourism and nature, and traditional crafts of Shiga. He takes guests mainly to Otsu (Mt. Hiei, Sakamoto, Ogi, and Katata), Takashima (Harie and Hata), Shigaraki (pottery and Miho Museum), and Omi-Hachiman (Okishima island and traditional boat rides). If you look at the YUtour website, you can see “Ready-made tours” with a set itinerary and pricing, and “Tailor-made tours” to other areas in Shiga upon request. Most of the tours are day trips from Kyoto, and Seita usually meets his guests at Kyoto Station at the tour’s start. He takes mostly individuals, couples, or small groups, but can also handle larger groups. Seita (in front) in Nakajima, Harie. Why take a guided tour instead of touring by yourself? When touring rural areas where public transportation is limited, English information is scarce, and where people don’t speak English, a guided tour in English makes it much easier. The guide can introduce you to local people (farmers, potters, craftsmen, etc.) so you can talk to them and ask questions. It makes your visit more enjoyable and educational. When it comes to outside visitors, rural folks always appreciate some kind of introduction. Just a simple introduction by someone they know is all it takes for them to open up their world, culture, and lifestyle to you. 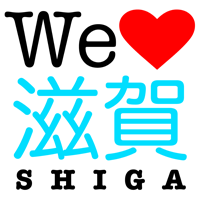 With the right connections, people in Shiga can be very friendly to foreigners. And Seita is that connection. 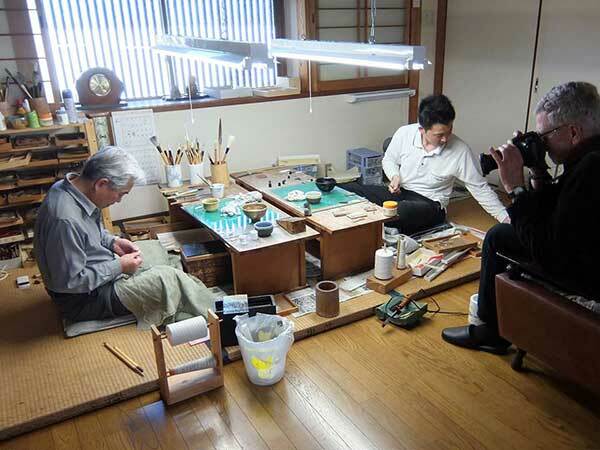 Calligraphy brush makers in Takashima. Kabata water basin is used to wash or chill fruits and vegetables. 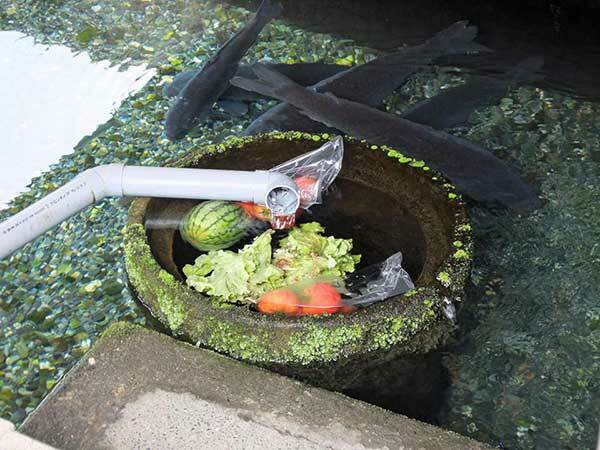 Carp also eat food scraps from washed dishes. YUtour’s most popular destinations are Harie (homes with “kabata” kitchen basins spewing natural spring water), Hata (farming community with terraced rice paddies), Shigaraki pottery centers, and Miho Museum. YUtour uses public transportation as much as possible so visitors can also experience what locals do. But if necessary, they will use a taxi or mini bus (for large groups). About 40 percent of YUtour customers are from the U.S., followed by Australians and Europeans. English-speaking tourists from Asia also take his tours. Since YUtour is a small operation, Seita makes the tours a lot more personal, personable, and flexible than with large tour operators. He tells me that he never gets tired of taking people to the same places and explaining the same things over and over. It’s because his guests are all different and they all have different interests, questions, and opinions and he enjoys talking to them. Seita learns a lot from them as well. So it’s a very interactive tour and not just a one-way lecture about this and that. I asked him what was the most common comment he gets from his visitors to Shiga: “So peaceful here!” Yep, laid-back Shiga is definitely a refreshing and relaxing break from the craziness and crowds of Kyoto. 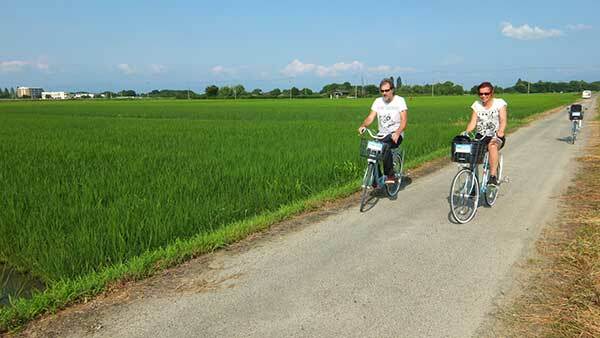 Cycling through rice paddies in Adogawa, Takashima. 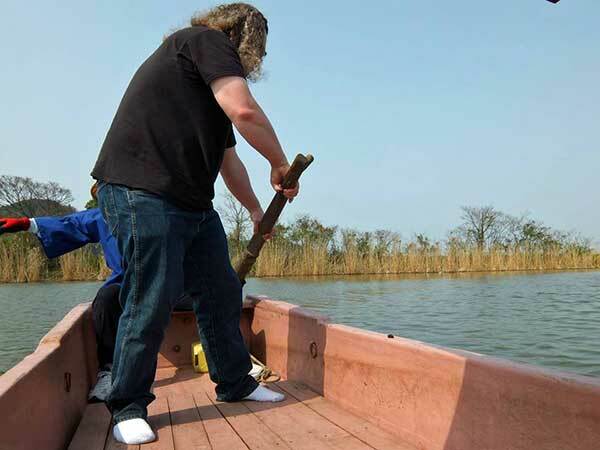 Hand paddling a boat through reeds in Lake Nishinoko, Omi-Hachiman. Old reeds around the lake are burned in early March to make way for new buds. Seita started YUtour in 2012 as part of his noble mission to help revitalize rural communities. Bringing foreign tourists was one way to do it. The “YU” (悠) in YUtour means “leisurely” in Japanese. I believe YUtour was the first professional tour guide service to start up in Shiga exclusively for foreigners. When I first heard about it, I didn’t think it would be so viable since Shiga is so little known overseas. Indeed, Seita did struggle to get customers during his first year in business. But he stuck with it and over the years, YUtour gradually became a very active and in-demand service. It has gained more customers as word spread, and it’s now on track for further growth. The increasing number of inbound tourists to Japan has also helped, and Seita is also seeing repeat customers. He is most busy in spring and fall when he can be booked for at least half the month. Least busy are the winter months. He has also been spotlighted in local Japanese newspapers and NHK Otsu TV news in 2017. I’m so glad to see him come this far to establish a niche for himself in Shiga. It takes a lot of dedication and determination and he loves what he’s doing. Seita also works part-time as a research assistant at Kobe University, so he does have a side job to fall back on when YUtour is not so busy. 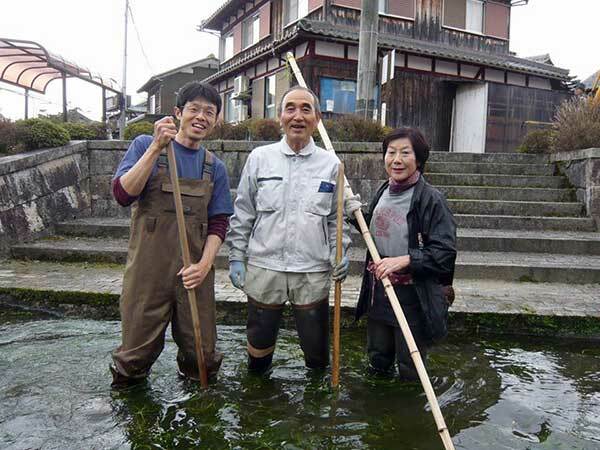 Seita (left) helps to clean waterways in Harie. I met Seita-san for the first time about a year ago when I invited him to one of my events. We didn’t have time to talk then, so we finally met up again over lunch in Otsu earlier this month. He also has a Ph.D degree, so we had very intelligent conversations (in Japanese). Besides me interviewing him, we also discussed tourism issues in Shiga and Otsu. 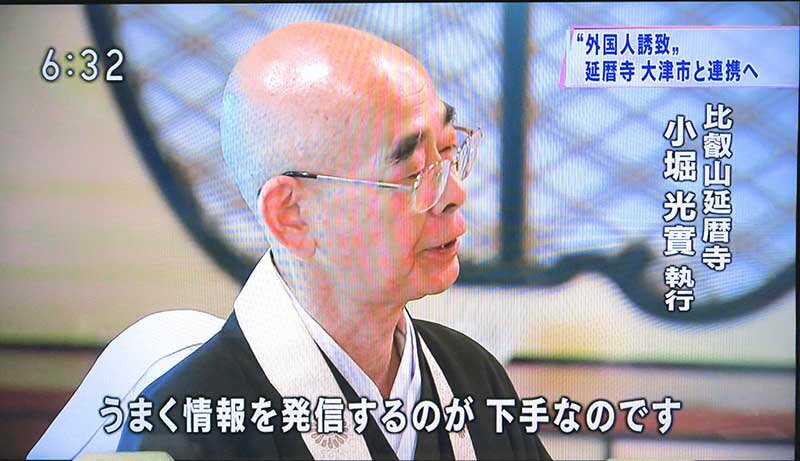 On NHK TV in July 2017, Enryakuji spokesman commented on their English weakness. One thing we talked about was Enryakuji Temple. Enryakuji recently admitted on NHK TV that they were not good at English PR. I told Seita that Enryakuji should just ask its overseas Tendai Buddhist temples to help produce English materials. I’m sure they would gladly help their headquarters temple produce the English for PR brochures, official website, and directional signs. They are native English speakers who know the religion and terminology, so they are very qualified to do it. When it comes to English PR, Enryakuji is way behind Koya-san in Wakayama Prefecture. Seita showed me the excellent English website for Kumano Kodo. Something that Enryakuji, Otsu, and Shiga could learn from. Seita and I also agreed that Otsu’s push to develop Chuo-Odori road between Otsu Station and Lake Biwa for tourists is not so promising since there’s nothing at the end of the road (except for a hotel). Yes, there’s Lake Biwa, but there are other more convenient roads leading to the lake. Otsu recently made a snazzy, eye-catching video just to promote that it’s only “9 minutes by train from Kyoto.” This should’ve been “Only 9 minutes TO Kyoto” instead. Have tourists stay in Otsu to visit Kyoto, rather than tourists staying in Kyoto to visit Otsu. People who lodge in Otsu drop more money than people who just visit Otsu, right? Otsu often serves as backup accommodations for people who can’t find hotel rooms in Kyoto anyway. So a “9 minutes TO Kyoto” campaign would have been more practical. Vice versa is a lot harder—getting tourists staying in Kyoto to visit central Otsu. Theoretically, being so close to Kyoto might sound good, but it can also be disadvantageous. Tourists who want to get away from Kyoto may think Otsu is too close and prefer to venture further away. This may explain why Harie and Shigaraki (both taking at least an hour from Kyoto) are more popular to visit from Kyoto. Well, I still give credit to Otsu for at least trying and coming up with ideas. But as I told Seita, I think Otsu is stuck in a hard place. It doesn’t have a trademark attraction like Hikone Castle in Hikone. Yes, there’s Enryakuji (World Heritage Site), but it’s almost part of Kyoto and most people go there from Kyoto. Otsu has other important Buddhist temples and Shinto shrines, but people who want to see temples/shrines might as well stay in Kyoto. There’s Lake Biwa and lake cruises, but the lake is not unique to Otsu. Otsu has a lot of things, but nothing stands out. So it lacks a strong and unique identity attractive to tourists. And Shigaraki (in Koka), despite its fame and popularity with foreigners, still has no official tourism website in English. (Google Translate doesn’t count.) Selling their wares to foreigners should really help (especially with the Tokyo Olympics coming up). 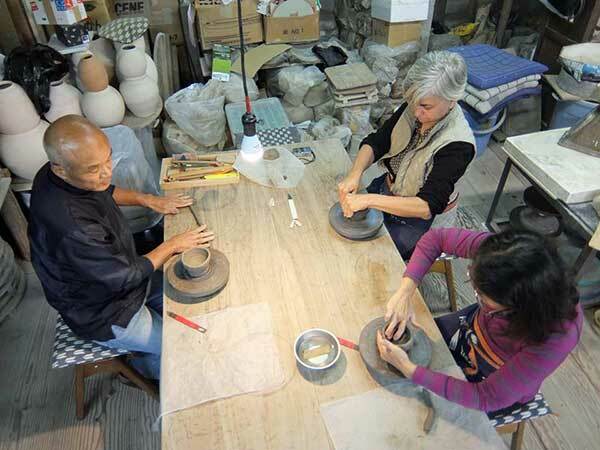 The Shigaraki pottery association should create an English website. 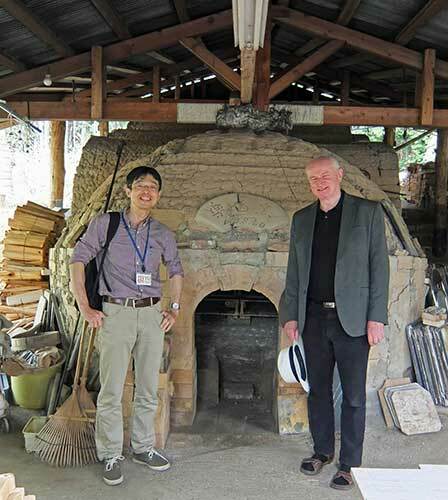 Shigaraki hardly has info in English except for Miho Museum and the Shigaraki Ceramic Cultural Park. Anyway, I had a good discussion with Seita-san and we’ll be keeping in touch. YUtour provides a very valuable and rare service in Shiga. I think Seita represents Shiga very well as a grassroots cultural ambassador spreading the word about Shiga. I find him to be very friendly and affable. He is another example of how even one person can make a big difference in Shiga. It’s not snazzy videos nor slick brochures. It’s the word of mouth that counts the most and Seita Mori is on the front line for that. To book a tour, go directly to the YUtour website. As of this writing, YUtour is not available for booking at travel sites like Expedia. 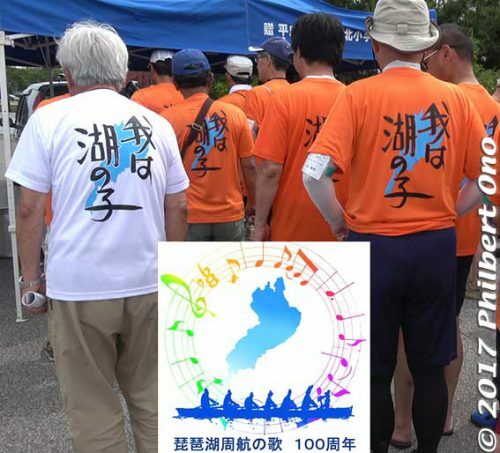 June 2017 was the 100th anniversary of Biwako Shuko no Uta (琵琶湖周航の歌 aka Lake Biwa Rowing Song), Shiga’s most famous song and one of Japan’s best hometown songs. 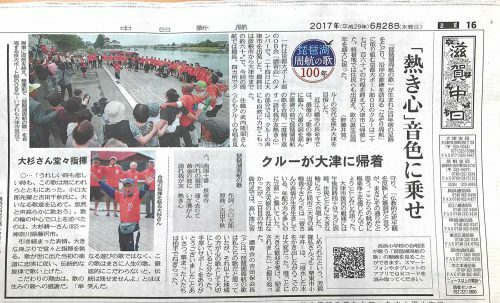 To mark this milestone, a series of events were held in late June 2017 in Shiga. They included a four-day rowing excursion around Lake Biwa during June 24–27, a choir contest in Imazu on June 25, the unveiling of a new song monument in Nagahama on June 25, and a major concert at Biwako Hall in Otsu on June 30. I didn’t see everything, but I did get a glimpse of the major events. 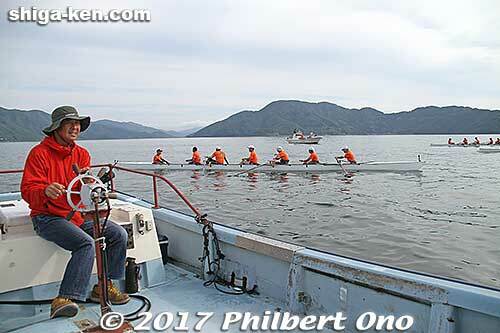 The rowing excursion was named Nazori Shuko (なぞり周航) which means “Tracer Rowing Excursion.” It traces the rowing route the Kyoto college boys took in 1917 around Lake Biwa, going clockwise from Otsu and on to Omi-Maiko, Imazu, Chikubushima, Nagahama, Hikone, Omi-Hachiman, and back to Otsu. The rowers lodged in Omi-Maiko, Imazu, and Hikone. 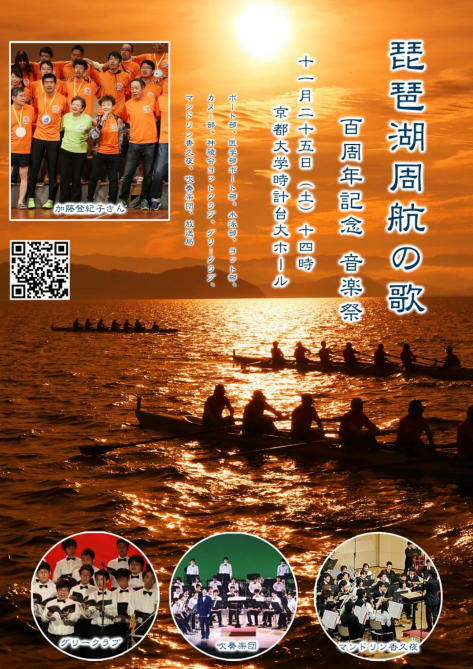 The rowing excursion was largely organized by Kyoto University Rowing Club’s alumni association (Noseikai 濃青会) with the cooperation of water sports organizations and fishing cooperatives in Shiga. About 120 rowing club alumni took turns rowing on three modern boats designed for long-distance rowing. 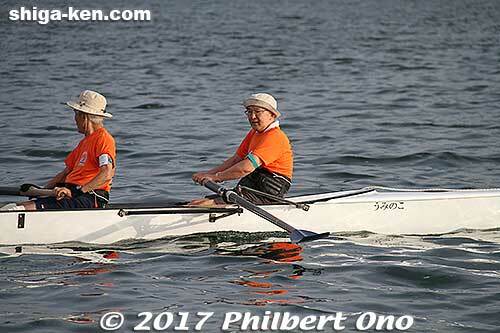 For four days, they rowed from around 5 a.m. until early afternoon. This is when the lake waters are most calm and air temperatures are cooler. The rowing excursion also had the participation of local people (住民参加). At times, the rowers were escorted by yachts, canoes/kayaks, and even standup paddleboarders. 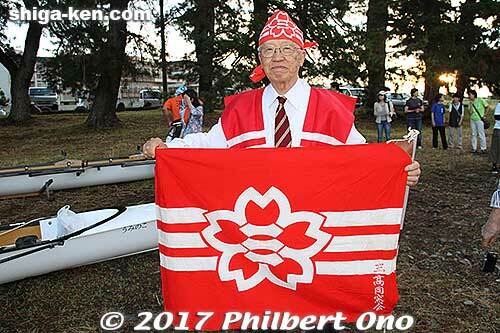 And at each major stop, the rowers were greeted by local folks including taiko drummers, dancers, and other well-wishers. The rowers also sang the song at each song monument around the lake. 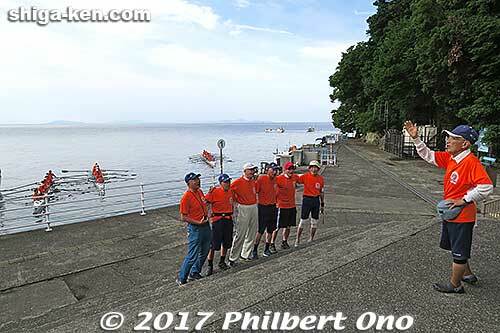 The four-day rowing excursion started at Otsu on June 24, 2017. 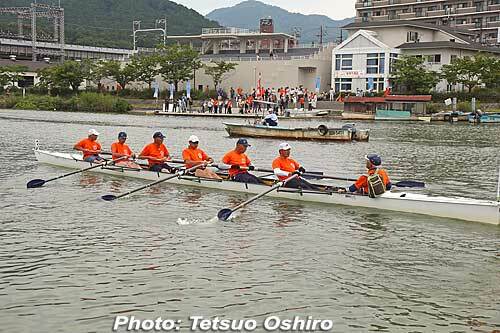 The rowers started out at the Kyoto Univ. Rowing Club boathouse on Seta River at 5 a.m. and stopped by here at Mihogasaki, in front of the rowing club’s original boathouse in 1917. They left Mihogasaki at around 7 a.m. as people cheered. 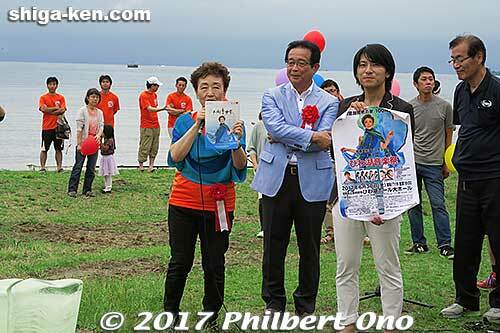 At Mihogasaki, Otsu Mayor Naomi Koshi (center) and former Shiga Governor Yukiko Kada (event committee chairperson) saw the rowers off. The man with the flag is an alumnus of the old No. 3 High School (university) (第三高等学校) that merged with Kyoto University. The old school’s logo with a cherry blossom and three stripes is on the flag and old boathouse. Rowers pass by Ukimido Floating Temple in Katata, Otsu. Taiko drummers greet rowers at Omi-Maiko. 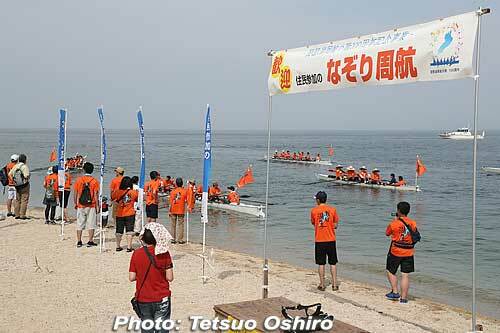 Rowers sing “Biwako Shuko no Uta” on the white-sand beach at Omi-Maiko. This is where they lodged the first night. Official T-shirts were also sold to the public. They came in white, dark blue, and green. 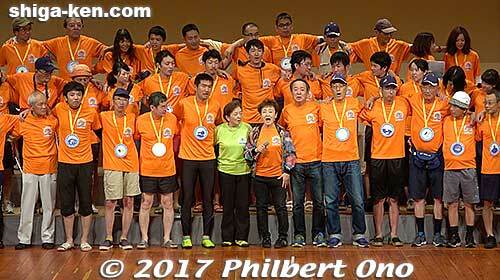 Orange T-shirts were reserved only for the rowers. The back says “Ware wa Uminoko” (We’re children of the lake) and the front had a small 100th anniversary logo (insert). 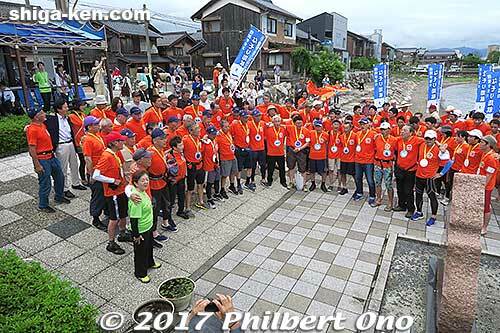 On June 25, the second day, rowers leave Omi-Maiko and head for Imazu up north. 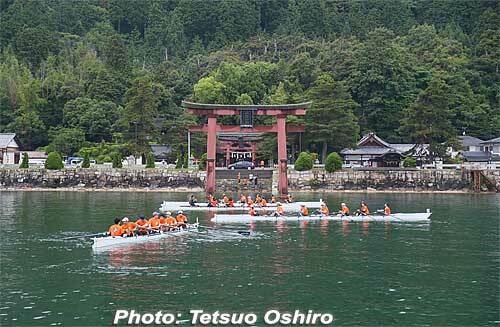 Rowers pay their respects at Shirahige Shrine in Takashima, famous for the torii in the water. 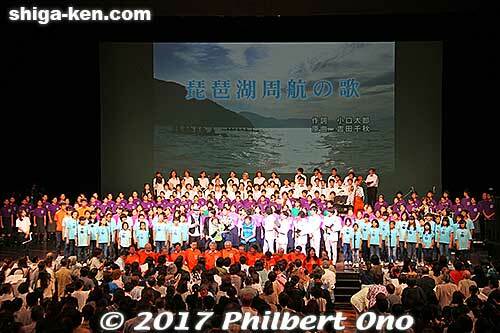 Imazu’s annual Biwako Shuko no Uta choir contest was also held on June 25. 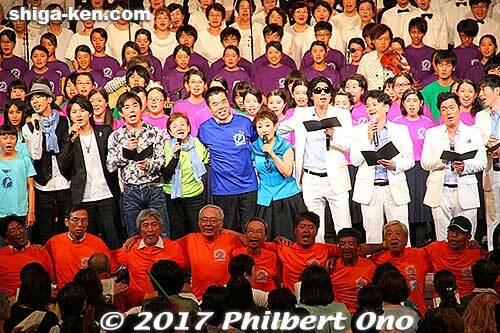 After arriving at Imazu, the rowers went to the concert hall (Takashima Shimin Kaikan) and went on stage with singer Kato Tokiko and Kada Yukiko (in green) to sing the song as guest singers. Kada Yukiko and singer Kato Tokiko at the center of the singing rowers swaying on stage. Also attending the choir contest were these three alumni from the old No. 3 High School which merged with Kyoto University in 1949. 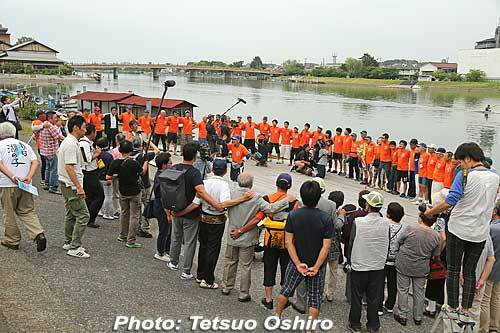 After singing at the choir contest, the rowers walked to Imazu Port and sang in front of the song monument. A busy day, but it wasn’t over yet. 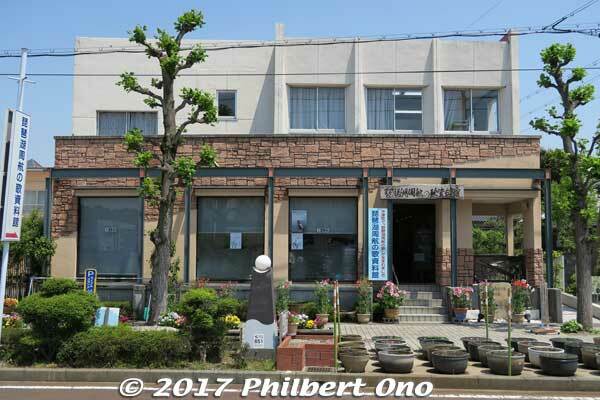 Biwako Shuko no Uta song museum (琵琶湖周航の歌資料館) in Imazu had special exhibits about songwriter Oguchi Taro and composer Yoshida Chiaki. The museum sells CDs of the song (including the English version) and the museum staff is very friendly. 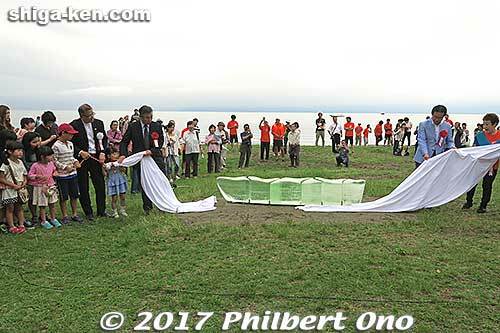 Also on June 25, a new song monument in Nagahama was unveiled in Hokoen Park near the lake shore near Nagahama Castle (map here). In summer 2016, a group of Nagahama residents formed a nonprofit (長濱歌碑でつなぐ会) to plan, design, finance, and build this new monument. They solicited donations to help foot the cost of about ¥8 million. Although they weren’t able to get more than ¥4 million in public donations, they somehow managed to pay for the new monument in full. 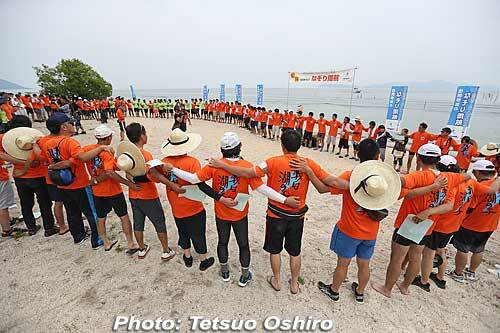 The opening ceremony was held at around 5:30 p.m. for sunset, but it was too cloudy. 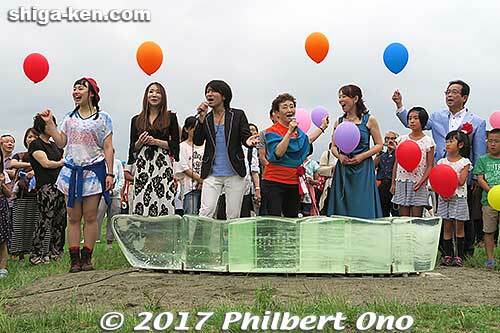 The ceremony was attended by a substantial crowd who came to see singer Kato Tokiko, former Shiga Governor Kada Yukiko, Nagahama Mayor Fujii Yuji, and local singers Kitagawa Akihiro and Matsuura Yoko help unveil the new monument. June 25 (Sun.) was the busiest day because it was the closest weekend to the actual 100th anniversary on June 28. That night, I went back to Imazu and stayed at a hotel near the station. While holding a copy of the concert program, singer Kato Tokiko gave a few words and mentioned the 1st Biwako Ongakusai music festival to be held on June 30 in Otsu. Holding the PR poster is Kitagawa Akihiro, ~Lefa~ vocalist. Kitagawa Akihiro and Kato Tokiko sing behind the new song monument and later everyone released balloons. 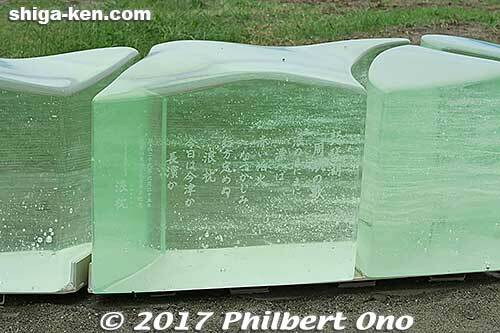 Verse 3 of Biwako Shuko no Uta is engraved on the center segment of the glass bench. Bolted down in concrete and made of solid glass, it is a park bench shaped like a boat. The top is wavy like water, inspired by nami-makura (rolling with the waves) in the song. The rowers prepare to depart Imazu at around 5 a.m.
On June 26, the third day of the rowing excursion, I checked out of my hotel near Omi-Imazu Station at 4:30 a.m. and joined the Kyoto University Rowing Club’s official photographers on a fishing boat. 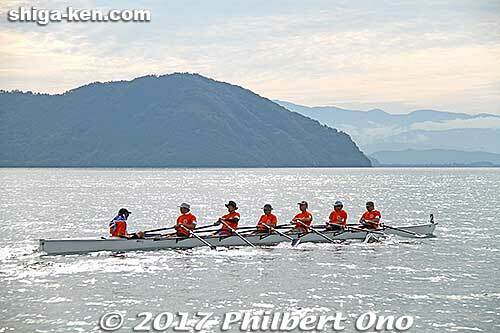 We followed the rowers from Imazu to Osaki, Chikubushima, Nagahama, and Hikone and kept our cameras busy. Alumnus of the old No. 3 High School (第三高等学校) at Imazu to see off the rowers at around 5 a.m. He was also at Otsu. At the center of the cherry blossom is the kanji for “san” (three). 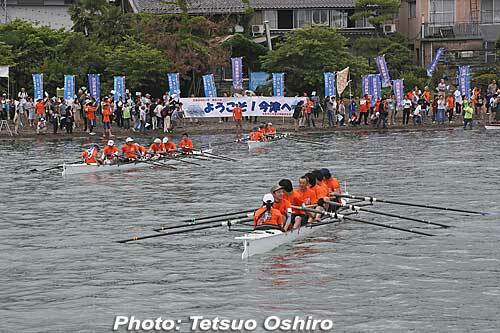 They first rowed from Imazu to Osaki where they would change rowers. This boat is named “Uminoko” (Child of the Lake). The other two boats are named “Tomari-bi” (Light/Fire on Shore) and “Sazanami” (Lake Ripples). They are named after a key word or phrase found in the song. The three boats they used belong to the Kyoto University Rowing Club. 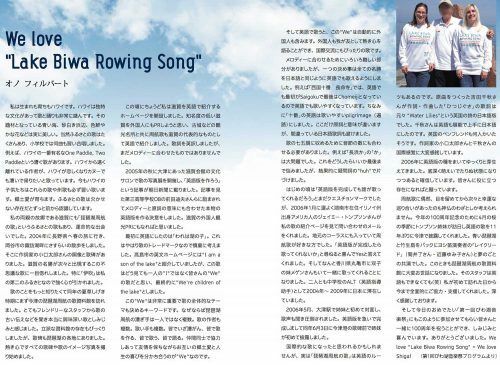 Thanks to donations from rowing club alumni, they were built in Shiga several years ago and designed especially for long-distance rowing around the lake. The boats have sliding seats and are quite stable in the water. They can also expel water automatically. It’s a far cry from the wooden, fixed-seat boats they used 100 years ago. The boats are normally used by freshmen members of the Kyoto University Rowing Club to row around the lake every summer. Rowing toward Chikubushima on a sparkling lake. Luckily, the weather was good during the four days. 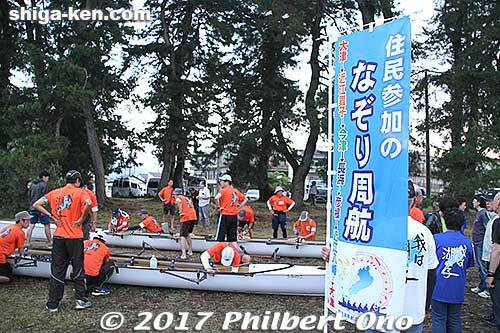 On sacred Chikubushima island, non-rowing alumni sing the song in front of the Verse 4 monument while the three boats solemnly look on. This was around 8 a.m. I wish more people could have witnessed this most interesting and unusual scene, but it was well before the arrival time of tourist boats. Besides myself, only a handful of official and press photographers were here to see this. The Mainichi Shimbun reporter hired his own boat just to photograph this. Mt. Ibuki in view as they row toward Nagahama. Our friendly boat captain knew well about lake currents and conditions. The waves got a little rough off Nagahama and slightly flooded the boats. Also on our fishing boat was the BBC (Biwako Broadcasting Co.) cameraman. 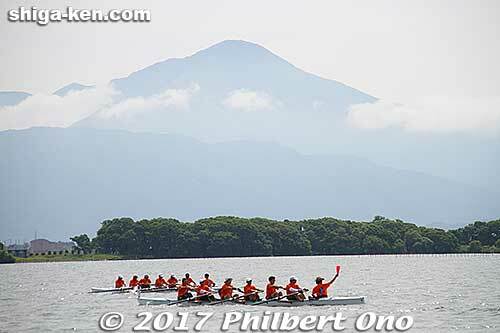 The NHK TV crew also hired a fishing boat to film the rowers. 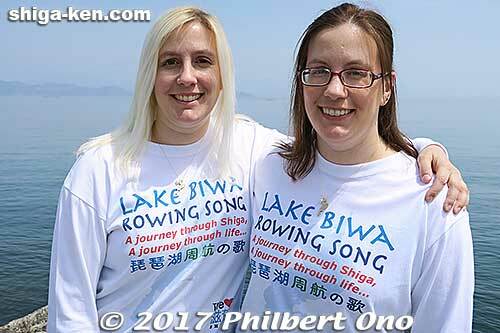 In July, both BBC and NHK aired special TV programs about the rowing trip. 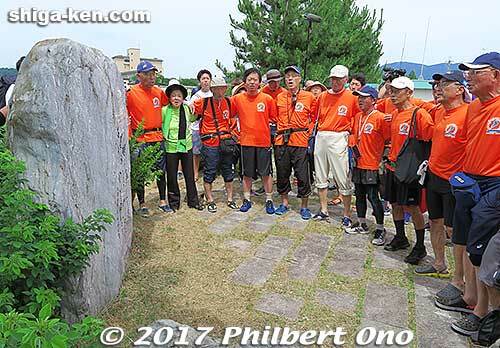 After reaching Nagahama at around 11 a.m., the rowers sing the song next to the new Verse 3 monument at Hokoen Park near Nagahama Castle. Nagahama was also a lunch break. The song leader (大杉耕一) directs the singing, backed by many local dancers (日本3B体操協会 滋賀支部). The new park bench song monument is behind him. 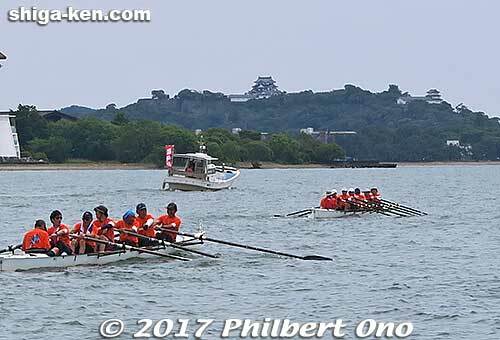 Rowers pass by Hikone Castle. 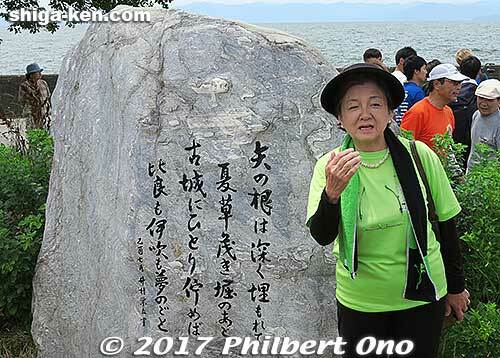 In front of the Verse 5 monument at Hikone Port, former Shiga Governor Kada Yukiko (event committee chairperson) asserted that the “old castle” mentioned in the song must be Sawayama Castle (Ishida Mitsunari’s castle) instead of Hikone Castle since the latter was never attacked (“sharp arrows buried deeply”). She’s got a valid point, but I’ve always assumed that it included all the old castles in eastern Shiga (Hikone, Nagahama, Sawayama, and Azuchi). This is another thing I love about the song. We can all have our own interpretations of it. 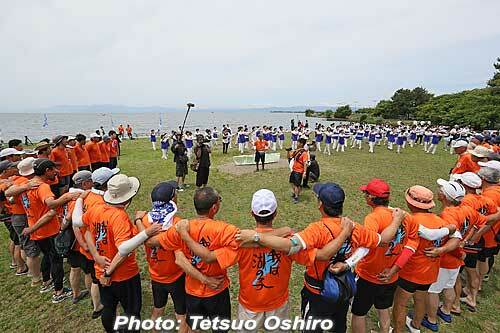 After reaching Hikone Port in the early afternoon, the rowers sang in front of the Verse 5 song monument. They sang here again in the early evening with a local school band and lodged in Hikone. 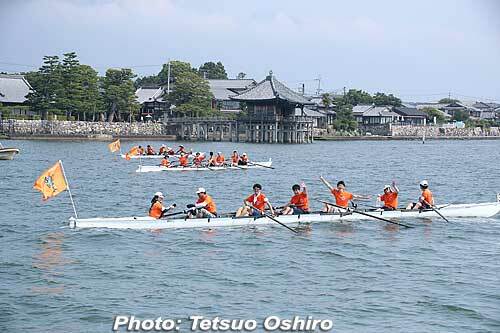 On June 27, the fourth and last day of rowing from Hikone to Otsu, they took a break at Omi-Hachiman (near the song monument at Horikiri Port) and even danced the Goshu Ondo (folk dance native to Shiga). 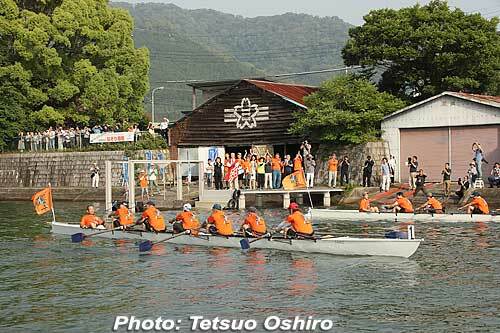 Rowers finally return to the Kyoto University Rowing Club boathouse on Seta River in Otsu at around 5 p.m. It was a long haul taking about 12 hours. They changed rowers four times. In front of the Kyoto University Rowing Club boathouse (Seta Karahashi Bridge in the background), rowers sing the song after a safe and successful four-day rowing excursion. Congratulations to all! 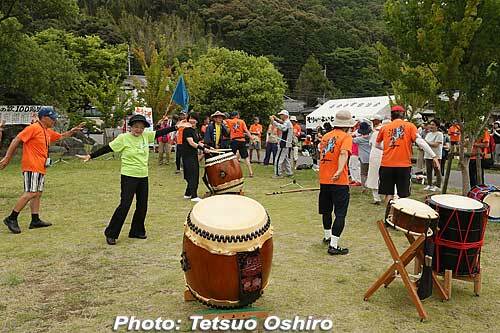 *Thanks to Tetsuo Oshiro for providing some of the photos on this page. 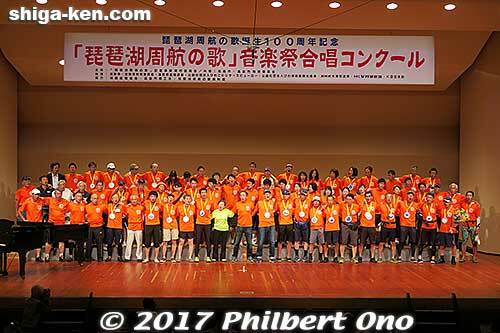 The rowing excursion was soon followed by the 1st Biwako Ongakusai (Music Festival) held on June 30, 2017 at Biwako Hall in Otsu. It was organized by a committee led by former Shiga Governor Kada Yukiko and produced by singer Kato Tokiko who made Biwako Shuko no Uta a national hit in 1971. Headlining the concert were top artists Miyazawa Kazufumi (Shima Uta was fantastic), Gospellers, the Tokiko Band (great musicians), and ~Lefa~ from Nagahama. The first half had local youth groups and choirs from Shiga, Kyoto, and Osaka. The second half featured the headlining artists and Kato Tokiko herself. This is the first Biwako Music Festival and they plan to hold this concert annually around Lake Biwa in the places mentioned in the song. So next year in 2018, it will be held in Omi-Maiko at Biwako Seikei Sport College whose president is former Shiga Governor Kada Yukiko. Then in Imazu in 2019. Kato Tokiko will be the producer of the annual concerts. It will take several years before the concert is held in each place mentioned in the song. One major objective of the Biwako Music Festival is to perpetuate Biwako Shuko no Uta to the younger generations since it is not really taught in schools in Shiga. That’s why you will see local youths performing as well. 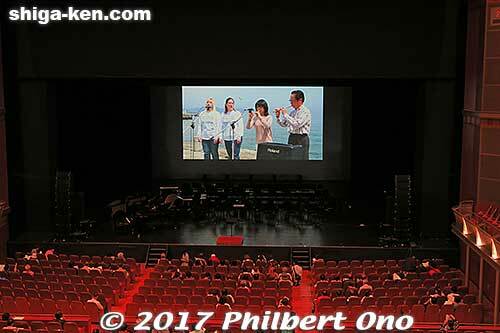 At the 1st Biwako Ongakusai Music Festival, a short film about the rowing excursion was shown while concert goers entered the concert hall. It also mentioned the English version of the song and showed footage of our mini concert held in Imazu in April. The short film was shot and edited by Biwako Broadcasting Co. 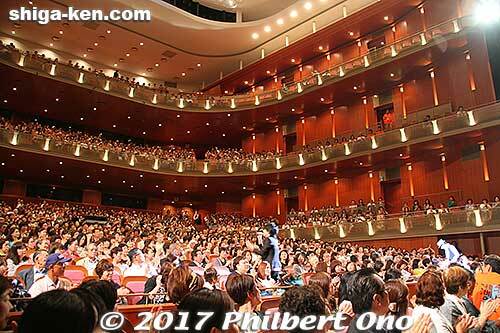 The concert was held in Biwako Hall’s beautiful Large Hall seating about 1,800. This is ~Lefa~ performing in the audience area for their first number. ~Lefa~ vocalist Kitagawa Akihiro (北川 陽大) also sang “Lake Biwa Rowing Song” in English. His partner Kono Hiroyuki (河野 弘行) played keyboard. Performing at Biwako Hall was their biggest venue so far, a dream come true. At the end for the finale, all the performers got on stage and sang Biwako Shuko no Uta. So nice to see so many young people singing the song. The audience also stood up and sang. 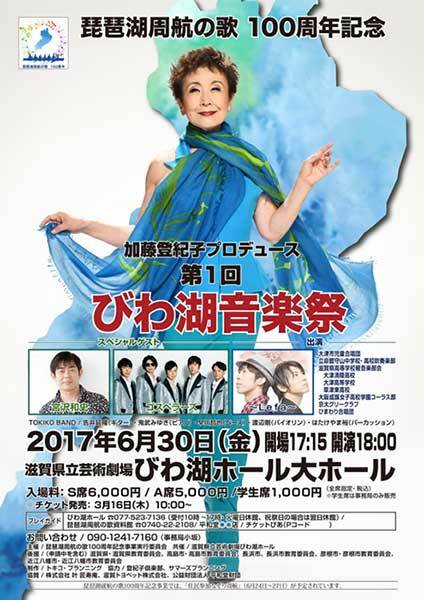 At the center are the former and current Shiga governors, Kato Tokiko, and other headlining artists all singing Biwako Shuko no Uta. It was a wonderful concert showcasing a wide variety of music and artists, both amateur and famous. We look forward to the next concert next year in Omi-Maiko. 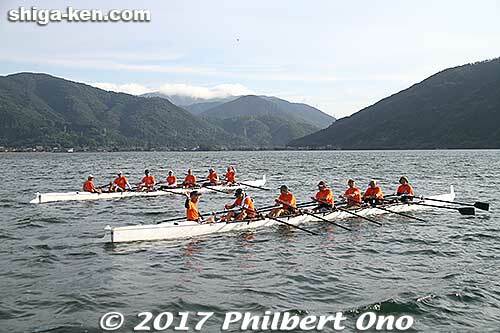 Otsukaresama and thank you to Kada Yukiko, Kato Tokiko, Kyoto University Rowing Club and their alumni association (濃青会), and everyone else who worked so hard to plan, coordinate, and execute these memorable events like never before. It got many local people involved and I was honored and happy to take part. This hometown song must definitely be perpetuated to current and future generations. It’s an important part of Shiga’s history and cultural heritage and should be designated as an Important Intangible Cultural Property (重要無形文化財). I hope that local educators and parents will come around and realize how precious this song really is to Shiga. Showcasing not only pretty scenes in Shiga, but also life itself. And the melody is classic and timeless. The story behind the song and its creators is also most fascinating. At the same time, the song retains an aura of mystery and intrigue. Commemorative events in Shiga are largely over, but not in Kyoto. Kyoto University will be celebrating the song’s 100th anniversary on Nov. 25, 2017 with the unveiling of a song monument plaque on campus and a lecture (by song researcher Iida Tadayoshi) and concert during their autumn school festival. I will be attending as well and looking forward to meeting guests from Okaya, Nagano (songwriter Oguchi Taro‘s hometown) and Niigata (melody composer Yoshida Chiaki‘s hometown). 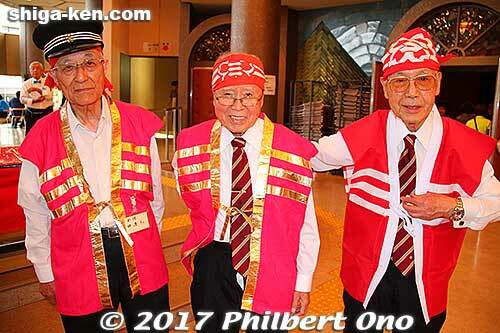 Update: Here’s my blog post and video of Kyoto University’s celebration of the song’s 100th anniversary on Nov. 25, 2017. PR flyer for Kyoto University’s 100th anniversary song event on Nov. 25, 2017. 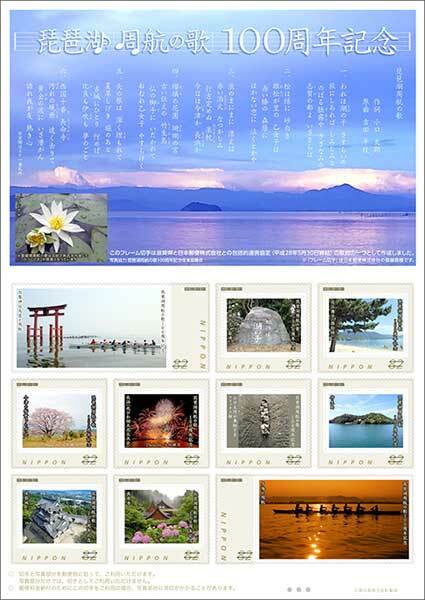 The Japan Post Office issued a sheet of stamps to mark the 100th anniversary of Biwako Shuko no Uta (Lake Biwa Rowing Song). Available while they last at post offices in Shiga. 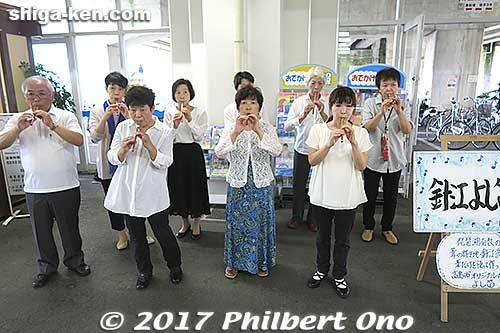 To celebrate the 100th anniversary of Shiga’s most famous and beloved song, Biwako Shuko no Uta (琵琶湖周航の歌), shiga-ken.com held a special mini concert in Imazu on April 16, 2017 with the cooperation of the Biwako Shuko no Uta Shiryokan song museum (琵琶湖周航の歌資料館) and Imazu Port in Takashima, Shiga Prefecture. 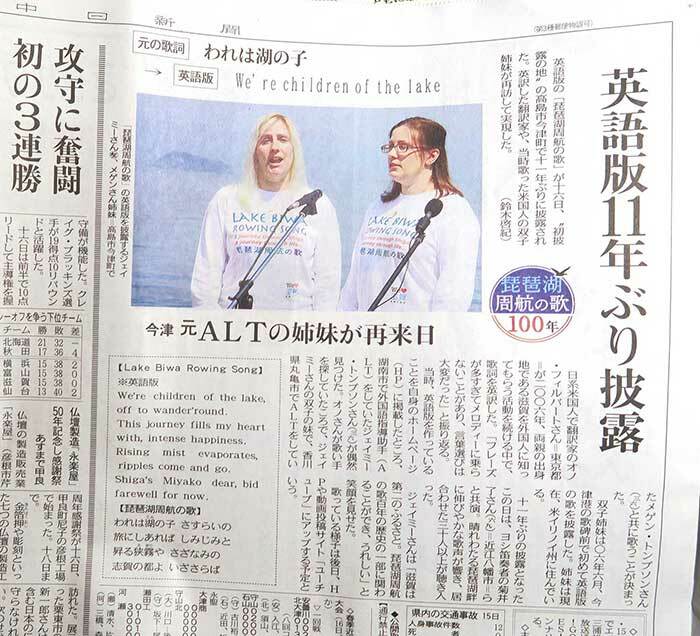 The highlight was twin sisters Jamie and Megan Thompson at Imazu Port singing Lake Biwa Rowing Song (English version of Biwako Shuko no Uta) to the accompaniment of Lake Biwa reed flutes (yoshibue) played by Lake Reed (レイクリード), a duo consisting of Kikui Satoru (菊井了) and Kondo Yumiko (近藤ゆみ子). The result was stupendous and oh so pretty, both in sight and sound on a beautiful day in front of a blue Lake Biwa at Imazu Port. Watch the 5-min. video embedded above and see for yourself. It was only our second time to perform at Imazu Port. 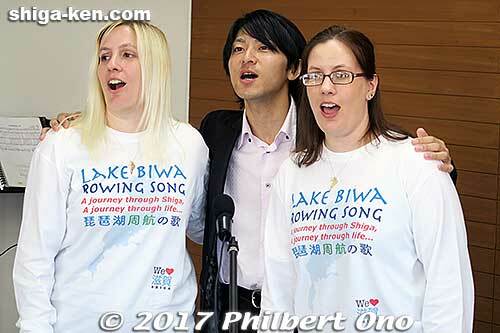 The last time was on June 3, 2006 when we first introduced and performed Lake Biwa Rowing Song in public. For this second time, I decided that instead of staging a repeat performance of what we did in 2006, we should do something different. Having Lake Biwa reed players join us was perfect. It turned out that it was the first time for Lake Reed to perform together with multiple singers. 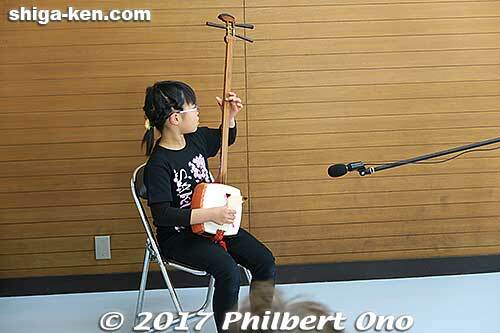 We also held an indoor mini concert at the Biwako Shuko no Uta Shiryokan song museum. 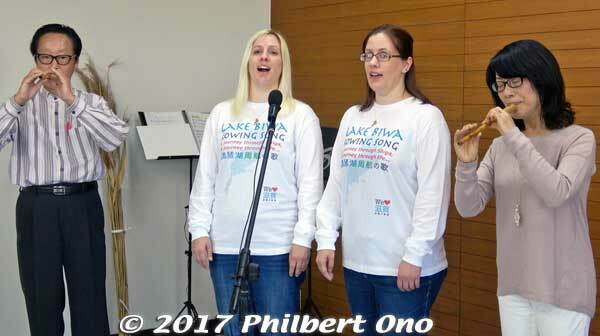 The performance of Lake Biwa Rowing Song was repeated and followed by three pretty songs by Lake Reed. Watch the 23-min. video embedded above. 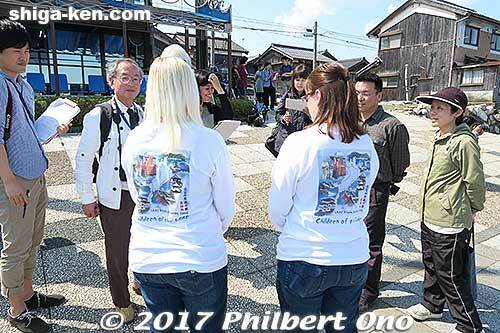 Jamie & Megan Thompson together in Japan for the first time in 8 years. Our mini concert turned out to be a media event with coverage by Asahi Shimbun, Chunichi Shimbun, Mainichi Shimbun, Sankei Shimbun, and Yomiuri Shimbun newspapers. I came prepared for the media with these T-shirts I designed and gave to Jamie and Megan to wear. I also gave them Biwa pearl necklaces (closeup photo below). 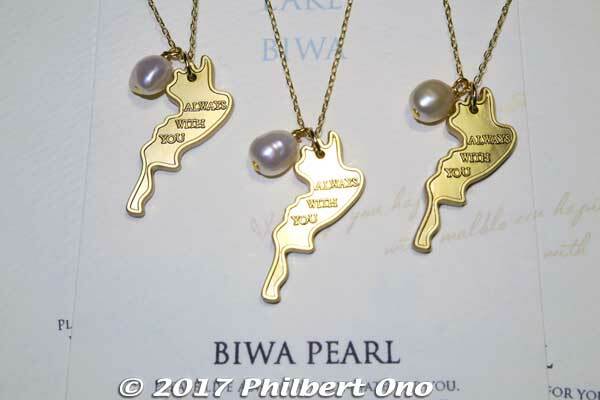 I had these Lake Biwa pearl necklaces custom-made for this day. I found a freelance accessory maker in Otsu named “Malble” (pronounced like “Marble”) who was making earrings using this Lake Biwa-shaped, gold-colored accessory. It says, “Always With You.” (Like Lake Biwa is always with you.) I had her make these necklaces strung together with a medium-size Lake Biwa pearl. They came out very nice at reasonable cost. Rehearsing inside the song museum before going to Imazu Port. 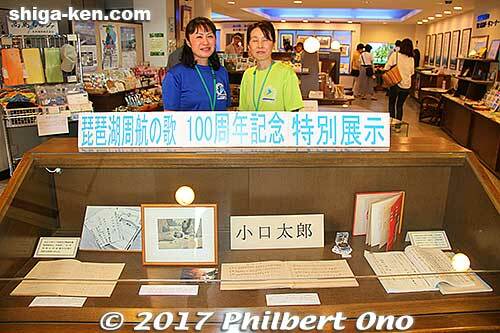 Since summer 2016, prominent people and organizations in Shiga and Kyoto announced plans to hold Biwako Shuko no Uta 100th anniversary events in 2017. I also wanted to take part in these events. So I asked Jamie and Megan (who sang Lake Biwa Rowing Song in English in 2006 while they were working in Japan as JET Program ALTs), if they could visit Japan in 2017 to participate in one of these anniversary events, especially in June (the song’s actual anniversary date) or November (Kyoto University’s main anniversary event). It turned out that they both could make it to Japan only in April 2017. Since there were no anniversary events in April, we held our own commemorative mini concert on April 16. Couldn’t let such a rare trip to Japan by both sisters go to waste. The performance at Imazu Port started at around 1:30 pm after all the cruise boats left Imazu Port. It was mainly for me to shoot videos for a music video (embedded at the top). The media also took photos and interviewed us under a somewhat hot sun. 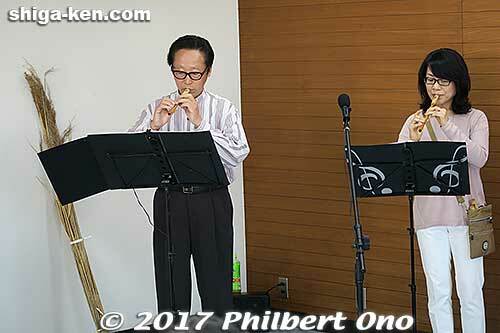 We then moved to the nearby Biwako Shuko no Uta Shiryokan song museum for an indoor mini concert and social gathering that lasted until about 4 pm. The ever so helpful and cooperative Biwako Shuko no Uta Shiryokan song museum allowed us to use their room on the second floor for our indoor mini concert. They also secured permission for us to perform at Imazu Port. I didn’t really publicize this event since it was intended for only friends and invited guests and the local media. However, during the 2.5 months of planning, the event started to take on a life of its own as it morphed into something more substantial. I knew things like this never go according to plan, so I remained flexible and played it by ear. As I expected, we ran behind schedule and were unable to do a few things that I had planned. But all-in-all, our event turned out very well with great weather, no accidents or illnesses, great videos and photos, and everyone having a fun time. Many people also went on the 3:30 pm Sakura cruise to Kaizu-Osaki afterward. I’m glad that it was worth coming to Imazu which is quite far for most of us. Jamie and Megan talk with the press. Back of the T-shirt is the CD cover and “Children of the Lake” below it. Biwako Shuko no Uta Shiryokan song museum, near Omi-Imazu Station. It has panel displays explaining the history and meaning of the song and a listening station where you can listen to many cover versions. Mini concert inside the song museum. 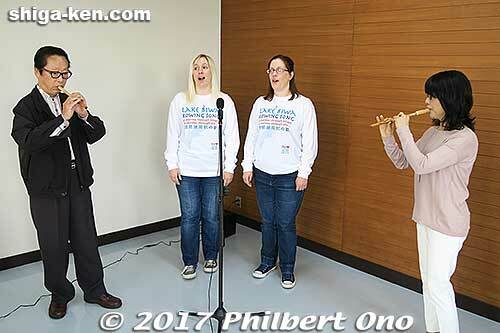 Our indoor mini concert started with Jamie and Megan singing Lake Biwa Rowing Song with Lake Reed playing Lake Biwa reed flutes. Lake Reed playing Lake Biwa reed flutes. They even brought a bundle of reeds (left) as a prop. Lake Reed then performed three songs: Furusato (Hometown), Miyagete-goran Yoru no Hoshi wo (Look Up at the Night Stars), and Umi no Koe (Voice of the Sea). (Watch the video to hear them play.) They were brilliant. So pretty. 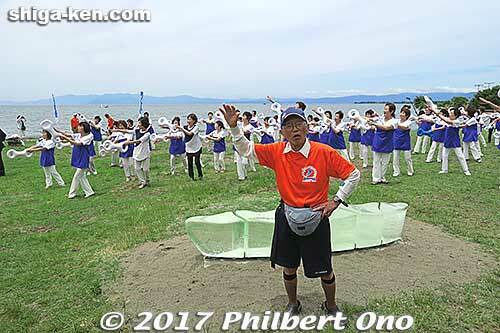 Omi-Hachman resident Kikui Satoru was the person who actually invented the Lake Biwa reed flute in 2000. So he’s been playing it longer than anyone else in the world. We were so lucky to have him and his partner Kondo Yumiko perform for us. Everyone performed on a voluntary basis, no one got paid. Over 50 people attended our mini concert inside the song museum. Mr. Kikui was also generous enough to bring 15 reed flutes to hold a sample lesson mainly for the kids who came. Unfortunately, we didn’t have time for it. Sounds like I have to plan a follow-up event to make it happen. Our third performer was Kiyora, a third grader from Moriyama. She played the famous cherry blossom song, “Sakura, Sakura” with her shamisen. As a beginner, she played quite well. Former Shiga Governor Yukiko Kada talks about the upcoming music festival in Otsu. Holding up the PR poster is Kitagawa Akihiro of ~Lefa~. 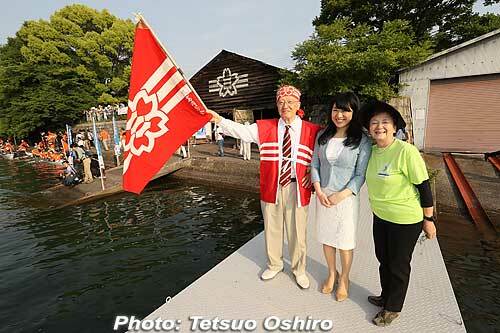 We were also honored to have former Shiga Governor Kada Yukiko attending our event. Being the president of Biwako Seikei Sport College in Omi-Maiko, she’s very busy. And yet, she made the time to hear us sing. We thank her for coming. 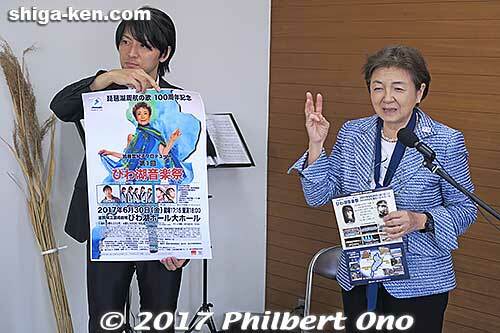 She and singer Kato Tokiko (who made Biwako Shuko no Uta a national hit in 1971) are organizing the 1st Biwako Music Festival (第一回びわ湖音楽祭) at Biwako Hall in Otsu on June 30, 2017. Tickets are still available as of this writing. Kitagawa Akihiro sings with Jamie and Megan. 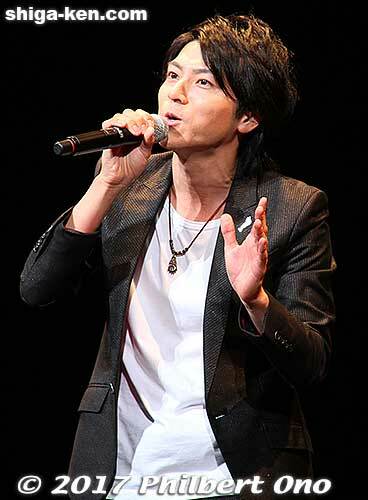 Another special guest was Kitagawa Akihiro, vocalist and one half of the Nagahama-based duo ~Lefa~. Akihiro once studied in Canada, so he does have an interest in singing in English. He sang in English with Jamie and Megan impromptu. He has a very good voice, so I see great potential in him singing in English after I coach his pronunciation. It was the first time for me to meet Akihiro. I saw former Governor Kada’s Facebook video of him singing Lake Biwa Rowing Song in English so I invited him to our event. ~Lefa~ was formed in 2010 and they play all around Japan at shopping malls, local events, etc., and sing Biwako Shuko no Uta. 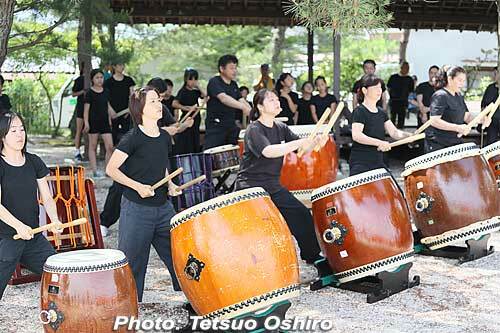 They also often hold mini concerts at Biwako Shuko no Uta Shiryokan song museum. The other half of ~Lefa~ is guitarist and keyboard player Kono Hiroyuki. 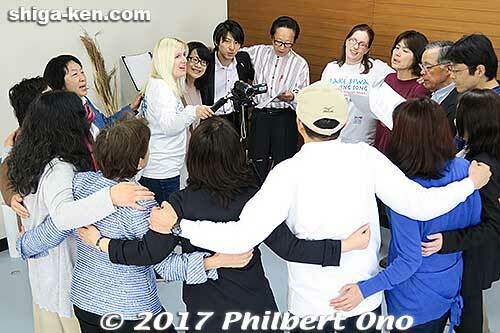 In the end, the few of us who didn’t go on the cherry blossom cruise to Kaizu-Osaki remained to sing Biwako Shuko no Uta in a circle. We were running an hour late. 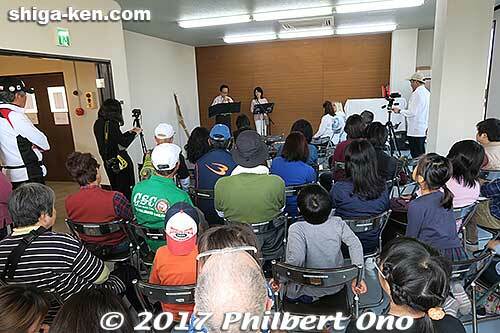 Most of the audience left at around 3:20 pm to catch the Cherry Blossom Cruise for Kaizu-Osaki departing Imazu Port at 3:30 pm. So only about 15 of us remained until we ended at around 4 pm. Everyone burst into smiles and started clapping after we finished singing the song in Japanese. It’s such a heartwarming song, and being from Hawaii where we have many, many renown hometown songs, I’m so glad Shiga has such a song. It’s been 11 years since we announced the English version, but slowly and surely, I see it catching on. 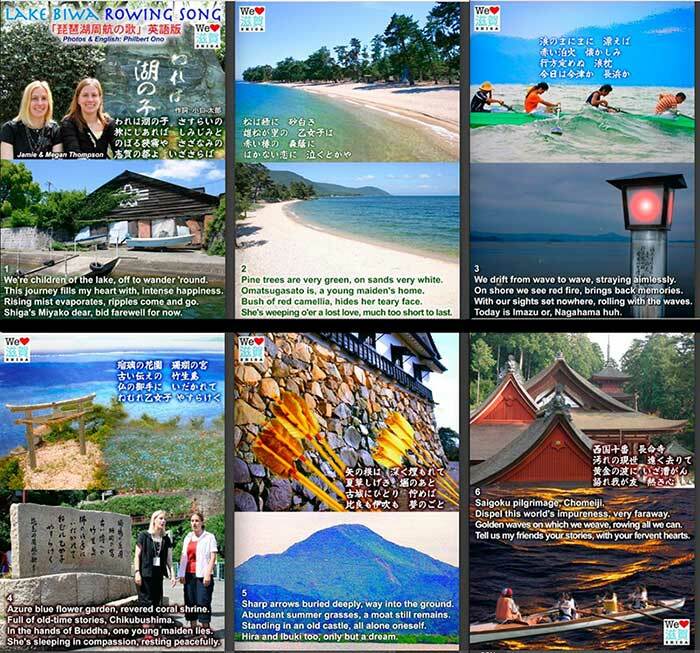 Set of six Lake Biwa Rowing Song postcards given as a free memento to all attendees. 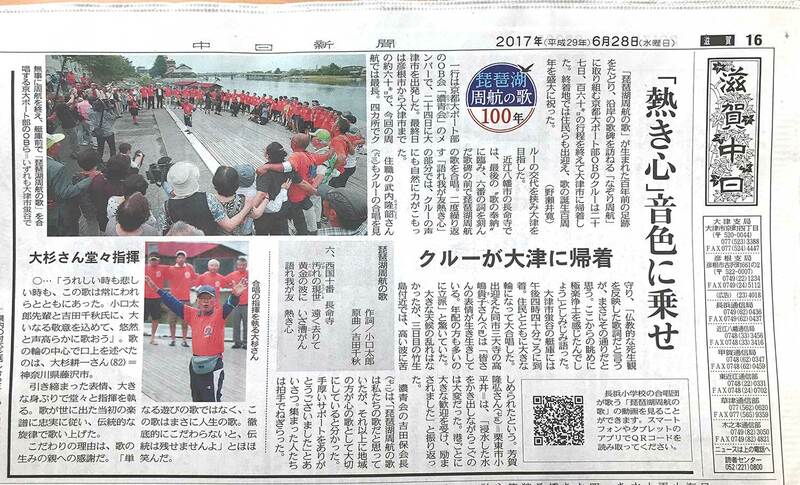 Chunichi Shimbun newspaper was one of five papers that covered us (April 17, 2017 issue).